ALL-IN-ONE PACK: Ear wax remover tool comes with 3 different tips. Large spoon(curette), small spoon, and tweezer. Kids, toddlers and babies who are under the age of 7, can be removed the ear wax from their ears with small spoon easily. Also children over 7 and adults, can be removed the ear wax with large spoon. Besides, there is a tweezers that you can grip larger ear wax and clean your ears for adults, children and infants. Everyone can use this cleaning kit from every age. BRIGHTEN YOUR EAR CANAL AND SAFE TO CLEAN The biggest advantage is that you can illuminate your ear canal to ensure visibility. Thanks to led light cleaner, you can easily see all the ear wax and remove it properly. You can remove your baby\'s ear wax without worrying.There are 4 Silicone Case for the tips, You can use it to avoid any hurt of your children\'s ears. EASY TO CLEAN AND 4 DIFFERENT CUTE CHARACTERS: After you use ear wax remover tool, you can easily clean them with water, no need to replenish the tips with another. 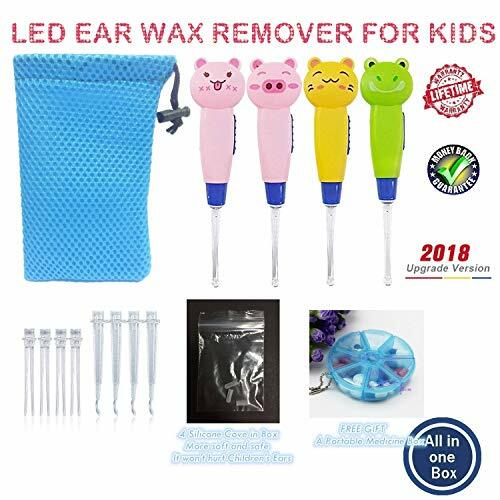 Earwax removal kit comes with 4 different characters; cat, frog, pig and bear. Most of the children do not like to be cleaned their ears. However, you can readily clean their ears with these cute ear picks. SIMPLE TO CARRY : You can carry all the tips and ear wax remover tool with drawstring mesh pouch, and ensure that you don\'t lose any of them.